Puerta de Alcalá stands at Plaza de la Independencia in Madrid. 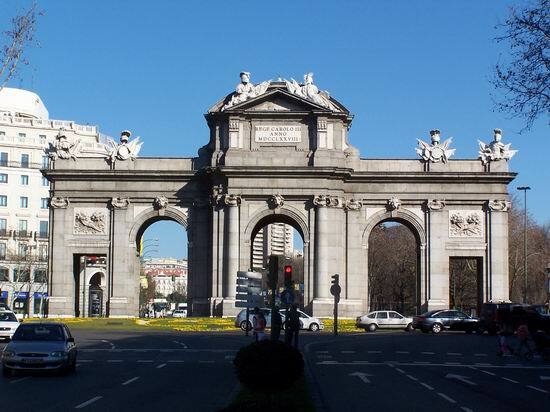 The original Puerta de Alcalá, which stood nearby, was built in 1599 as a welcome gesture to doña Margarita de Austria, who was the wife of King Felipe III. When Carlos III came to the throne of Spain one and a half centuries later, he entered Madrid in great style on December 9th, 1759. He was not at all pleased with this city gate, thinking it quite unsuitable for an important royal appearance. He demanded that a much more flamboyant gate should be built, and called for architects to present their proposed plans. Although several great architects of the age, such as Ventura Rodríguez and José de Hermosilla presented their proposals, it was an Italian architect, Francisco Sabatini, who was finally granted the commission. In 1764 the original Puerta de Alcalá was demolished and work started on the grand new gate. 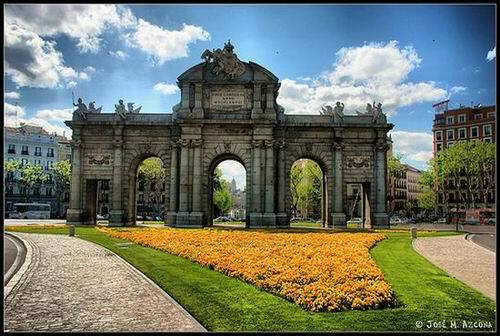 The new Puerta de Alcalá was completed in 1769 and its official inauguration took place in 1778. The Puerta de Alcalá stands in the east of the city. It is in the middle of Calle de Alcalá, one of the oldest streets in Madrid, and which runs from the Puerta del Sol in the city centre outwards to the town of Alcalá de Henares, lying to the northeast of the city. The gate has a large central semicircular topped arch, flanked by two similar arches. They are in turn flanked by two square lintelled gates, five in all. There are six ornamental statues that adorn the top of the gate. These were the work of sculpture artists, Francisco Gutiérrez and Roberto Michel. The raised central part at the gate's highest point has a plaque, which reads: "REGE CARLO III ANNO MDCCLXXVIII." This commemorates the date of the gate's inauguration by King Carlos III. Because Calle de Alcalá is considered a cañada real, or a special route for moving livestock on a seasonal basis, flocks of sheep and other animals often used to pass through its portals. On July 30th, 1854, the Count of Villahermosa entered Madrid through the gate after losing a battle. The people of Madrid nicknamed him "Longinos" - likening him to the Roman soldier who was said to have pierced the side of Christ at the crucifixion - because of the enemy spear he was brandishing. In 1985 the gate was immortalised in song when Ana Belén and Victor Manuel released a record called, "La Puerta de Alcalá," which went on to become a huge success in Spain and throughout South America. The closest Metro station to Puerta de Alcalá is Retiro; the gate is within a few metres of the main entrance to the Retiro park. Metro station, Banco de España, lies slightly further away to the west, just past the Cibeles Fountain on Calle de Alcalá.